Fact, fiction, folklore legend or urban myth – who knows the truth of the story now? What is undoubted is that the Napoleonic Wars were as driven by propaganda as any war of the modern age. 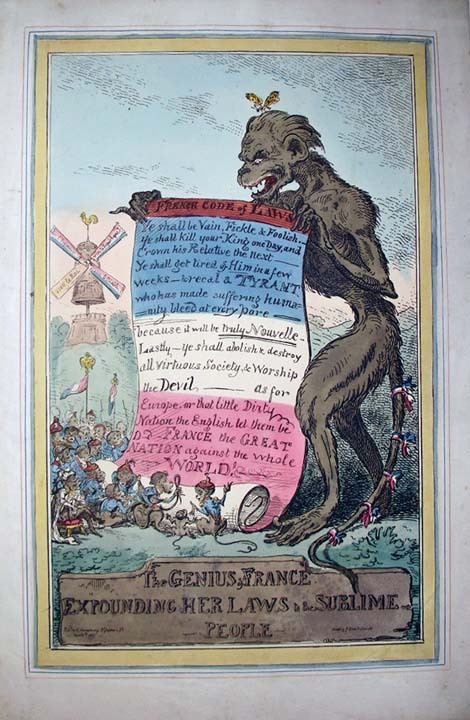 The likes of Gilray and Cruikshank represented the pinnacle of satirical caricature of the enemy but they were just the best known of a myriad of propagandists publishing in broadsheets and pamphlets and a common representation of their French targets was as apes or monkeys. The example here is called “The GENIUS of FRANCE EXPOUNDING HER LAWS”. It is a common ploy even now to denigrate your adversary, to represent them as subhuman and in the Napoleonic era things were no different. So, with this cultural backdrop, when a French ship was wrecked on a stormy December night at the beginning of the 19th century on the remote Northumberland coast, the scene was set for a bizarre sequence of events. 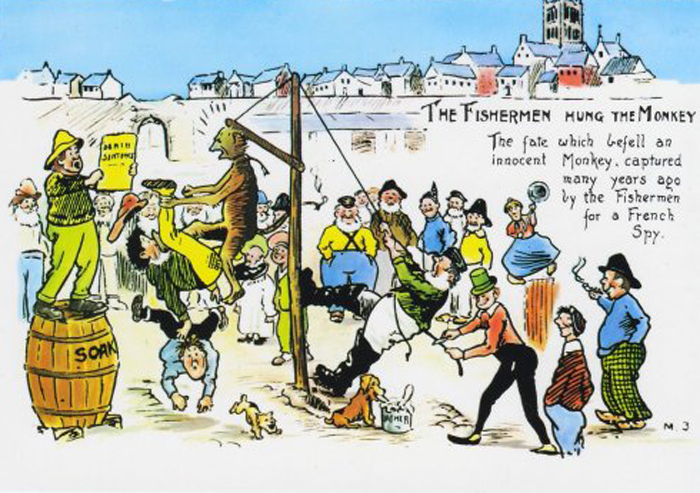 The fishermen of Hartlepool watched as the ship was blown ashore and dashed on the rocks but later they found the sole survivor, a monkey, dressed in a sailor’s uniform. It would have been the ship’s mascot but in the thinking of the locals this was something different. This must be one of those subhuman Frenchmen they had seen in the papers. It didn’t help the monkey’s case that it refused to answer any of the questions put to it. So its fate was sealed – it must be a French spy. After an impromptu trial staged on the beach the ‘court’ found the monkey guilty of espionage and sentenced it to death. The sentence was carried out immediately and the poor creature was hanged on a makeshift gallows made from the mast of a small fishing vessel. So the tale is told to this day. 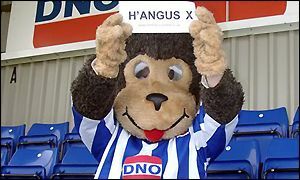 Hartlepudlians are still known as “monkey hangers” and their football team mascot is H’Angus the Monkey. In 2002, Stuart Drummond campaigned for the office of Mayor of Hartlepool in the costume of H’Angus the Monkey and won; he used the election slogan “free bananas for schoolchildren”, a promise he was unable to keep. Perhaps more interesting though, and definitely more sinister, is the suggestion that the story has a much darker origin. 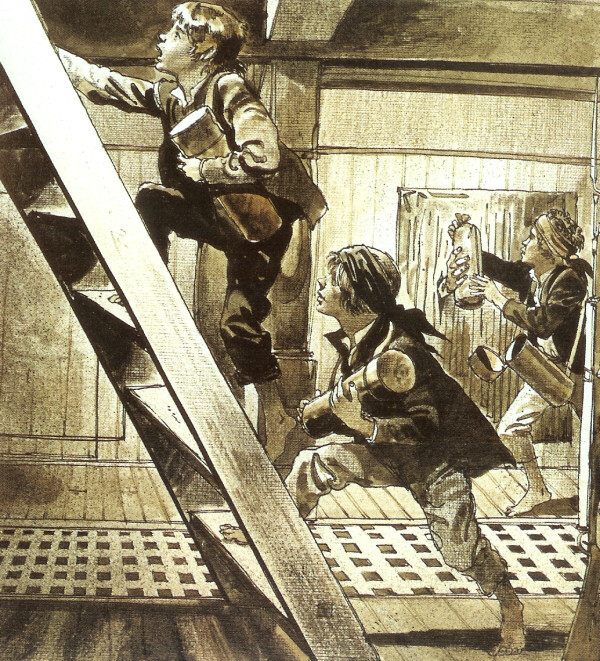 On warships of the time, young boys served below decks, charged with delivering gunpowder from the ship’s magazine to the gun crews. These boys were known as Powder Monkeys or just Monkeys. Might the hanging on the beach at Hartlepool have been an altogether different affair? Whatever the truth, the story of the Hartlepool monkey has endured over two centuries, and is still as strong as ever.